Sterling was trading sharply lower today after falls in commodities prices reignited fears of a global slowdown. Nervous markets sent the VIX (the global fear index) rocketing over fifteen percent. Oil and metals saw big falls while safe haven assets received their usual uptick in such times. The Japanese yen rallied. Bond yields fell across the board as traders bet on lower growth and weaker inflation (and hence lower interest rates) going forwards. GBP/USD fell by more than one percent as traders retreated to safer plays including the US dollar and Japanese yen. Selling began in the Asian session and sent cable abruptly into the support area at 1.5350. The day’s pivot levels were easily breached due to heavy selling activity. GBP/USD has now retreated to the 62% Fibonacci level marked from the top to the bottom of the two week-long rally. Sterling had been a strong recovery story as investors briefly put aside their fears over a global China-led slowdown. Those fears have resurfaced and GBP is suffering the backlash. 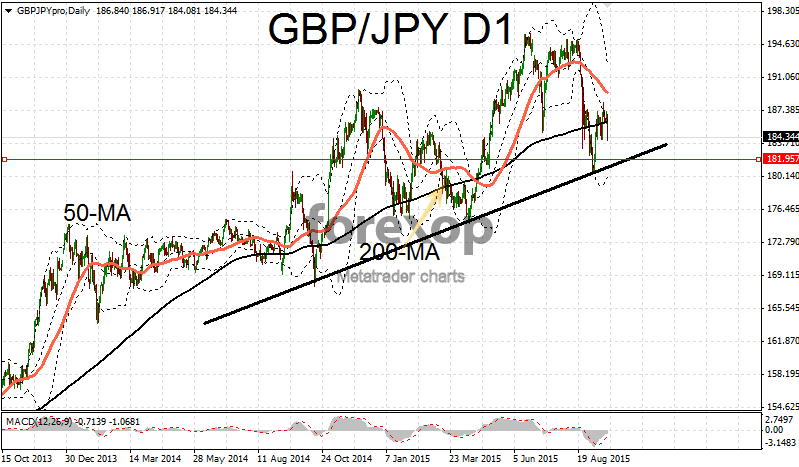 GBP/JPY was one of the main casualties of the reversal of risk positioning. GBP/JPY dropped 1.5 percent to 184.31 as traders marked down sterling in this “risk off” climate. The pair was consolidating “bearishly” beneath the 200-day moving average. 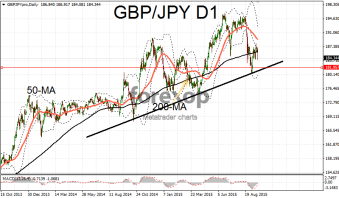 After completing two upwards cycles GBP/JPY looks set for a further downward correction before attempting any upwards move. The pair certainly has enough downwards momentum to test the lower end of the range at 182 within the foreseeable future. The UK economy remains fundamentally sound despite suffering a minor soft patch in the second to third quarters of this year. However any revision of the interest rate schedules on the part of the Federal Reserve is likely to affect sterling in equal measures. The Bank of England is likely to be at least some months behind the Fed’s schedule. In the UK, public sector borrowing was up in August. Official figures showed net borrowing rose to £11.31B during the month – far higher than the £8.65B that was expected. However some encouragement came from the fact part of the shortfall was due to the technical reason of shift in late payment dates.